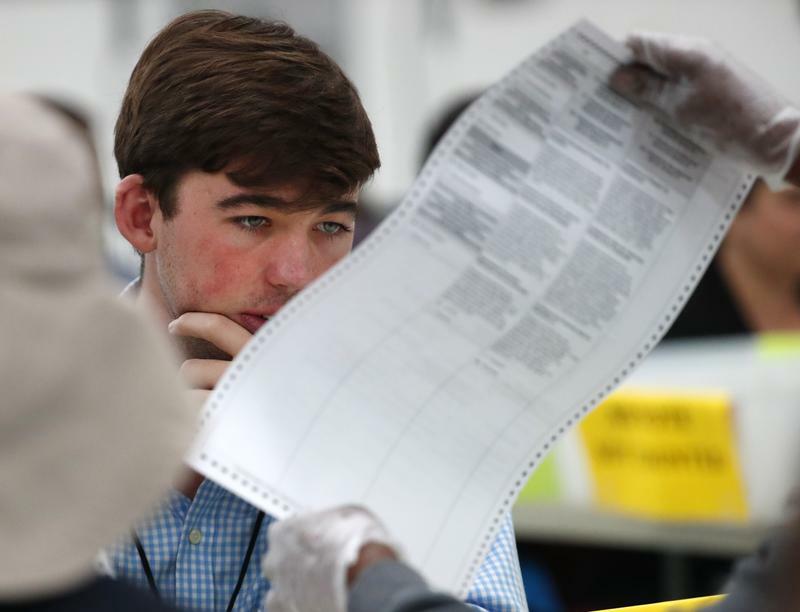 An observer looks at a midterm ballot during a hand recount in Broward County, Florida. 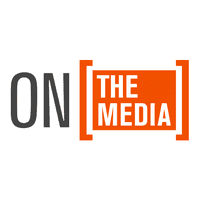 BROOKE GLADSTONE: From WNYC in New York this is On the Media, I'm Brooke Gladstone. BOB GARFIELD: And I'm Bob Garfield. As votes are counted and recounted in Florida, Georgia and elsewhere, we face a great crisis in this country. BOB GARFIELD:That crisis is disguises. BOB GARFIELD: Yes, Donald Trump–who's been lying about rampant voter fraud before his own 2016 victory–a search that Democrats appeared at the polls in costume to cast multiple fraudulent votes. This is where the media like to use the phrase--. MALE CORRESPONDENT: The president offered actually no evidence to back up his claim. And keeping him honest, that's probably because there isn't. BOB GARFIELD: Yes, without evidence, without plausibility but not without effect. In his constant, totally made up allegations of voter fraud–which his own presidential commission imploded trying to even make a case for–Trump has successfully created a trope. A standard accusation for explaining any electoral challenge. FEMALE CORRESPONDENT: And growing drama over the midterms as Florida governor Rick Scott files a bombshell lawsuit accusing Democrats of trying to steal the election. BOB GARFIELD: Oddly the leader so far in the vote count for Georgia's governorship, Brian Kemp, doesn't mention his systematic suppression of likely Democratic voters before the election–in his then role as Georgia's Secretary of State. Fifty-three thousand, mostly minority voters were disqualified over trivial mismatches in registration information such as missing middle initials. That was a scheme by the Republican candidate himself for his own electoral benefit. And this is the guy now screaming theft. Because he can. Because Fox News, Breitbart, Sinclair, The Daily Caller and the rest of the GOP propaganda machine are inculcating their audiences with the false narrative. Fox's Tucker Carlson. BOB GARFIELD: Say it over and over, and for many in your audience it becomes the truth. BOB GARFIELD: Thus these fraudulent accusations will achieve exactly what they intend–to undermine citizens' faith in their most fundamental right. The rhetoric claims to protect the sanctity of the democratic process but it is merely the devil in disguise. Consider this 2012 piece from a local NBC affiliate in Miami that ran with the headline nearly 200,000 Florida voters may not be citizens. The story was quickly debunked. The correct number in the end turned out to be 85, and they were removed from the rolls with no effect on the election that drew twelve million votes. But the false narrative still lives because the people who say the mainstream media deliver fake news, when convenient, use those very news organizations to validate political lies. A host of right wing bloggers, tweeters, junk news sites and no less a statesman than Donald Trump Jr. himself tweeted that old discredited NBC headline as if it were a current story proving their voter fraud big lie. Will Sommer, who writes about the pro-Trump media for The Daily Beast, has been tracking the conspiratorial buzz surrounding Florida's recount. Will, welcome back to the show. WILL SOMMER: Thanks for having me. BOB GARFIELD: As you wrote, the furor around the Florida ballot count has transformed the parking lot outside the Broward County Board of Elections office into a kind of Woodstock for the 'R the Donald Set.' OK that's the pro-Trump sub-Reddit. What did you witness there? WILL SOMMER: Witnessing from afar via livestream and Twitter and all that, the Florida ballot count–especially in Broward County–attracted all sorts of right-wing oddballs. People looking to stir up questions about the legitimacy of the election as well as people who are sort of looking to promote themselves and their PayPal accounts along the way. BOB GARFIELD: One of them was a US congressman. WILL SOMMER: That's right, Matt Gaetz from northern Florida. This is not his district. Matt Gaetz basically is laying out this idea that the 2018 election in Florida is an elaborate dry run. WILL SOMMER: He stood with a big pack of fake ballots that was meant to imply the Democrats were inventing ballots. BOB GARFIELD: You mentioned PayPal accounts, Tell me about Ali Alexander. WILL SOMMER: Ali Alexander is one of these kind of right-wing Internet creatures. He told his followers, we can't trust the GOP to not let the Democrats steal this election. So he goes down there and he's saying, you know, send me money and I'm going to stop Bill Nelson from stealing this election. Some members of the Proud Boys, the far right Western chauvinist organization were there. Laura Loomer, who's also a right-wing internet personality was there. So it really became quite a circus in that parking lot. BOB GARFIELD: What about the bomb threat? WILL SOMMER: A couple days ago at the Fort Lauderdale airport, there was a suspicious package. So the sheriff's office went out there and various right wing characters saw this as proof that the sheriff himself was faking a bomb threat in order to cover up the destruction or the creation of ballots. BOB GARFIELD: There were some video shared by a congressional candidate named Tim Canova on Twitter. WILL SOMMER: It's grainy footage that looks like it's shot outside, what might be a board of elections or a polling place. It's dark and people are carrying boxes. WILL SOMMER: It's really unclear or even whether these are ballots these people are carrying. Tim Canova is not exactly the most credible person. He is a Seth Rich conspiracy theorist. BOB GARFIELD: This is the member of the Democratic committee staff in Washington who was murdered on the street and right-wing memes have it against all police conclusions that he was murdered by the Democrats themselves for something or other. WILL SOMMER: Right. The implication is exactly that Hillary Clinton killed him, you know, for various very shadowy reasons. So Tim Canova has promoted these conspiracy theories. And despite him not being very credible, Republicans really ran with this video. And that in many ways is sort of what started the focus on Broward County. Marco Rubio, among others jumped on this video and said, you know, this proves it all. BOB GARFIELD: We actually get a glimpse of the supposed smoking gun ballot box video in an ad that was run by the right-wing super PAC Great America Alliance. WILL SOMMER: Brenda Snipes is the supervisor of the Board of Elections in Broward County. She has become sort of the great nemesis of Republicans who claim that she is stealing the election. WILL SOMMER: Brenda Snipes does not appear to be the most efficient operator of a board of elections. She's had some controversies with the ballot counts in the past. She was asked during this election cycle why it's taking so long to count the ballots. MALE CORRESPONDENT: But other counties have been able to do it. BRENDA SNIPES: But other counties don't have 600,000--. WILL SOMMER: And someone said well Miami has more people than we do and they had no trouble with their ballots. MALE CORRESPONDENT: But it's a serious issue, it always seems like--. BOB GARFIELD: She is conveniently flummoxed and also I would say conveniently Black. WILL SOMMER: We've seen time and again Republicans focus on women or people of color and especially women of color in a way that I think is often disproportionate to their prominence within the Democratic Party. For example Maxine Waters or Alexandria Ocasio-Cortez really get latched onto as these big villains on the right. BOB GARFIELD: But is there any evidence, and is it even possible in her capacity for her to somehow influence the count. WILL SOMMER: In the Florida state government, of course which is stocked with Republicans and Rick Scott loyalists, they have come out and they've said they've seen no evidence that there is any fraud going on here. BOB GARFIELD: I want to come back to that NBC story we discussed, the local Miami NBC story about the supposedly unlawful 200,000 voters. It was appropriated by Donald Trump Jr. and the rest of the right-wing-asphere, but in the last couple of days something happened. Tell me what. WILL SOMMER: The local news station there–after being pressed by a former Snopes editor–they added to the headline this story is from 2012, realizing that people often don't look beyond the headlines or beyond what they see on social media, making clear to people that this is an old story and not relevant to anything in 2018. BOB GARFIELD: Well, hat tip to Brooke Binkowski for intervening in that one. Now there is one thing that seems qualitatively different from past Trump-ruptions. I mean, we're used to the trolls and we're used to the right-wing media going all in on these red herrings, but the apparent Senator elect of Florida, Rick Scott, who was governor of Florida himself went all in. Likewise Brian Kemp in Georgia. Could it be that we are headed towards a world of questioning every election as kind of mainstream Republican thought? WILL SOMMER: I think it absolutely does. I mean, we're seeing everyone from the candidates themselves to Marco Rubio–one of the most prominent Republican senators in the country. And I think a lot of this does derive originally from Trump who is a famous birther conspiracy theorist among other conspiracy theories he believes in. He's sort of legitimize the idea of going maybe a little kooky on the right in terms of your political ends. And I think it's decades of conspiracy theories, decades of Republican attacks on institutions like the media and academia that have sort of driven Republican voters into a place where they're reluctant to believe in establishments that are outside the right-wing media and the GOP themselves. Additionally I think the internet and social media really speeds a lot of this stuff up and makes it possible for people to find other people who are going to reinforce their beliefs no matter how ludicrous they may be. BOB GARFIELD: Will, thank you. WILL SOMMER: Thank you for having me. BOB GARFIELD: Will Sommer writes about the conservative media for The Daily Beast and for his weekly newsletter Right Richter. BROOKE GLADSTONE: Steven Wright said it was wrong that only one company makes the game Monopoly. Coming up, how long before Amazon's the only game in town?